← “Conflict” Resolution – What Would You Do? Is Groupon running out of gas? In the early days of Groupon, I was intrigued. My marketing efforts are nearly 100% internet-oriented. It seemed like an easy and reportedly very effective way to attract new patients to my practice. And, I had heard of some crazy success from other dentists – attracting literally HUNDREDS of new patients. Count me in! Or not. 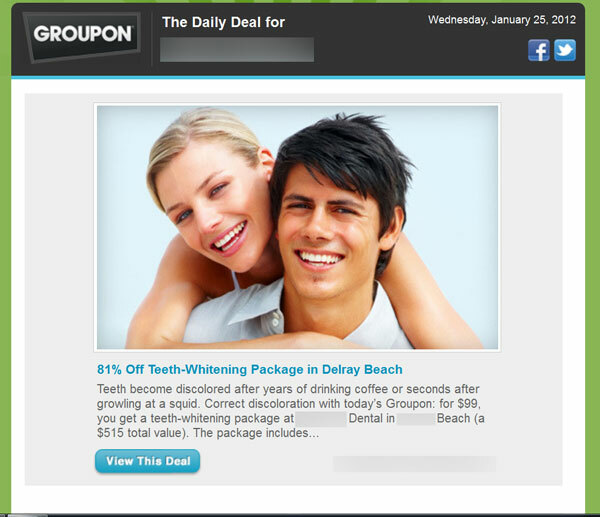 The popular Groupon deals for dentists seem to center around a deeply discounted initial exam or teeth whitening. I’ve also seen many deals for deeply discounted Invisalign treatment. In fact, the discounts for Invisalign seemed so deep, I cannot figure how the dentists don’t take a LOSS on the deal. This one came in my email just yesterday for a local dentist. Here’s how Groupon works (to my knowledge): You and Groupon set up the deal. Though I’ve heard that Groupon is pretty adamant that THEY know “what works.” So, the deal is pretty much dictated by them. Then, they blast an email out to their subscribers in your area. The new patients buy the “Groupon” directly from Groupon. The new patients show up at your office for the deal. Groupon SPLITS the take with you and pays you out over three months. So, keep in mind that you get only HALF of the already deeply discounted fee being paid. So, “half off” your normal new patient exam fee would net you only 25% from the deal. Of course, you also have to subtract your overhead and costs of providing the service. I believe the idea is not so much to make a profit (obviously), but rather to consider it the COST of acquiring new patients. I’m not against spending money to acquire patients. OK…. all marketing costs money. Acquiring new patients via any sort of marketing has a cost. Ultimately what matters is the ROI. The question is: With Groupon, are you REALLY acquiring new patients? That is… are they patients that will STAY with your practice? Will they seek other services from you beyond the Groupon deal, giving you a positive ROI? The answer: It seems your mileage may vary. I’ve heard both good and bad from other dentists. But, the preponderance of feedback seems to be that they get overwhelmed with these “new patients” scheduling for the “deal.” And, then those same patients move on to the NEXT “deal.” On the other hand, I have also heard from a smattering of dentists that they’ve managed to get some big cases and longevity from these patients. They’ll suggest that you must “wow” them to keep them. OK… I can relate to that. I would hope we all try to “wow” ALL of our new patients, regardless of source. Based on what I’ve heard on the “interwebz,” I suspect if I was to take a poll of dentists who have actually used Groupon, a significant majority would say they would NOT do a Groupon again. Even those that got a bit of a positive ROI say the trouble isn’t worth it. There are other concerns I have with Groupon. A number of news articles have reported that Groupon is in deep financial doo-doo. They’re in the red – by a lot…. but dodged bankruptcy with an IPO. It’s beyond my simple level of financial acumen to understand how a company that takes HALF of your fee for simply sending out an email blast can be in the red? Yet, even with a “successful” IPO, folks are jumping ship. Some have suggested that Groupon is “poised for collapse.” But, do your own Googling about Groupon’s financial status. Already Oregon’s state dental board has made Groupon (and similar) illegal. Another article about Groupon fee-splitting from the plastic surgery side of the story. And, according to a report by the folks at The Dental Buzz, Align Technologies is cracking down on doctors who set up Groupons for Invisalign. This is possibly VERY thin ice, folks. At first I did… then I didn’t. When Groupon was first announced in limited cities, I was interested. It wasn’t yet available in my area, but I sent them an email to please contact me as soon as it was. I never heard back. But, then I found Groupon had finally come to my area. I sent another email inquiring on how I could participate. After a LONG wait, they emailed me back and said they weren’t interested in ME. No kidding. Apparently, there weren’t enough online reviews for my practice. OK, whatever… I had since learned a lot about them and was no longer interested. A race I don’t want to win. My friend, Mark Dilatush at New Patients Inc., described discounting dentistry very aptly as a “race to the bottom.” When you base your “unique selling proposition” (USP) on low price, your patients will likely be the type looking for the next best deal… perpetually. You set your fee at $80 for a new patient exam. Then your competition sets it at $70. Then you go to $60. Then they go to $50. Rinse and repeat… all the way to the bottom. This one just came in today from Living Social. To be clear, I am not being critical and FULLY understand the reason a lot of dentists are doing this. I’m have been VERY tempted. And, I can easily second-guess my decision to reject the concept. This ad came to my email from Living Social. Here is the “small print” from the same Living Social ad. They must be desperate (to pick me). We have expanded our merchant base and I am interested in potentially featuring your practice. I wanted to reach out to you in order to discuss possibilities. Do you have a good time for me to reach you? Thank you! Before, I wasn’t “good enough” for them. Now they want me. No thanks. My interest was piqued in the early going. But, I’m glad they rejected me and prevented me from making what I now see might have been a mistake. I wouldn’t dare make a suggestion either way. Groupon isn’t the only game in town. There are others, such as Living Social. I haven’t heard much about the others, nor have I researched them. You have to do your own homework. You have your own business compass. Use it and make your own decision. And, feel free to share your results with us! PS… NBC Nightly News just ran a segment about “coupon healthcare” and featured a dental office (Dr. Greg Diamond). He claimed to have gained 1,300 new patients in a 24-hour period. That’s NOT a typo. I find it a bit hard to believe. And, if I suddenly had to accommodate 1,300 new patient exams and prophies… well, I’m not sure how I’d do it! Gosh… I thought my fees were on the high side. And, I don’t practice in New York City…. but, yowza! I thought the objection to social coupons on the segment was a bit silly, with the guy suggesting that the “credentials” may not be “vetted” by the coupon companies. That’s hardly an issue, in my opinion. But, the legal issue of fee-splitting was never brought up. Hmmm. This entry was posted in Marketing, Social Media and tagged coupons, discount dental, groupon, internet coupons, living social, social marketing. Bookmark the permalink. 50 Responses to Is Groupon running out of gas? This is exactly what is wrong with dentistry. “The bottom half of the dental market…” Really? In the millions of calls we have received from new patients looking for a provider, the only patients not concerned with price are those who have insurance and want to book and appointment, or they are so wealthy it just doesn’t matter (the 1%). The bottom half of the dental market you are talking about are hard working people who do not have disposable income to throw around and therefore want to check-out pricing before just giving a dentist an open checkbook. But you also forgot one thing. They may ask about prices, but they then also check out the provider to make sure he has good reviews, is competent in the area of services they are looking for (especially for elective procedures like veneers or Implants). And for the record, think about all the times you or your wife have gone online and shopped for a trip, or clothing, or even a service or the 4 Seasons even. Does that mean you are on the bottom half of all those industries or just a smart consumer? Hmmm… that’s interesting and quite possibly telling (about a few issues). The only ones NOT concerned with “price” are those with “insurance.” Hmmmm… What does that tell us about what happens when the consumer no longer cares about cost? What does it tell us when there is a third party payer that takes the consumer out of the free market picture? Actually it only confirms what we already know. The combination of disinterested consumers and third party payers ALWAYS causes the cost of goods and services to go UP. One needs only to look at medical insurance, medicare, and government health entitlement programs to see the writing on the wall. Of course you have your own experience. I have mine. And, mine is diametrically opposite of yours. It really is. And, I believe we attract that which we want to attract. I have a totally FFS practice. No insurance participation. Believe me… nobody chooses my office based on “price.” 🙂 And, I do attract a very wide spectrum of patients. What they DO have in common is a desire to get the best, not the cheapest. And, that is no lucky happenstance. First… Mark didn’t forget about ANYthing. Trust me on that! LOL! He’s one of the most brilliant marketing minds I know. But, this comment contradicts (a bit) your previous comment. Are they interested primarily in “price?” Or, is it competence? Finally, in ALL markets, arguably there is a “top half” and “lower half.” Mark is not implying any sort of qualitative characterization of the consumers that occupy the lower half or the upper half, for that matter. He simply recognizes that they EXIST. And, for the time being, America remains a FREE PEOPLE in a FREE MARKET. Both halves of the consumer spectrum are being well-served. Just as there are the two halves of consumers, there are dentists that are more than happy to serve each one. Mark is simply speaking to those dentists who need to decide which half they serve. Nothing wrong with either half. But, the reality is you cannot effectively serve both. Mike, I did a series on the Groupon/Living Social deals on my blog…Casepresenter.com, back in October. It’s amazing that organized. Dentistry even let’s them operate in our profession. If you think insurance companies are bad…then dealing with these people is like dealing with the Mafia…actually they may be the Mafia. Check out my blog posts…and search the web for Groupon horror stories. They have effectively lowered the price of teeth whitening to $99… Nice! I can’t find your article on that website. Got a direct link? Sorry Mike, I actually posted the articles on my other blog: TAOofDentistry.com. the posts werte called The End of Tooth Whitening and How to Structure a Social e-commerce deal. If I was a stock speculator, I’d definitely be shorting GRPN. In my opinion, services like Groupon devalue what we provide as health providers, since it discounts a service versus a product. Sure, I want a deal as much as the next person, and would buy a book from Amazon rather than pay 30% more for the same thing at B&N, but then again, it’s a book, and it’s the same regardless of the source. But service is whole another ball game. I understand the attraction though, esp if there is a high chance of getting new patients, but there is the (higher?) uncertainty whether these patients will hop on the dentist across the street who is giving away crowns for $50. I would think that keeping quality to a 100% is mentally and financially tough when your ROI is 25%. I disagree. Dentistry is tough and the fees are high. The cost and labor of an exam, X-Ray and cleaning are about $45 to a dentist and yet they list at over 10X that. The biggest reason a dentist will complete an exam is so they can find more work to be done and to have the opportunity to sell treatment. The fact that these types of programs encourage people to come in and start treatment is reason enough to run them. I have never seen a dentist who can survive on exams and cleanings. The real ability is in conversion to additional services and that is where a program like this makes sense. More importantly, the old days of dental insurance covering providers in any major way is over (less than 30% have it nationwide). And what about dental insurance? When an insurance company sells a dental plan and offers two free exams and cleanings…is that fee splitting? Where is the beef on that freebie? At least with social media, you can offer cash patients fees for additional services that make sense for you individually. Remember, we all have teeth. The idea that only people who have a lot of money can get care and everyone else must let their teeth fall out if they don’t pay Usual and Customary fees is a big mistake for patients and our profession. Any help in the form of reduced fees to encourage going the dentist is a great thing in my opinion. You’re free to disagree, of course. I’m assuming you’re not a dentist… pardon me if I’m mistaken. My assumption is based on your mathematical calculations of the cost basis of an exam and x-rays. You’re very, very far from reality on both sides of your equation. Groupon is absolutely fee splitting. So-called “insurance” is NOT fee splitting. 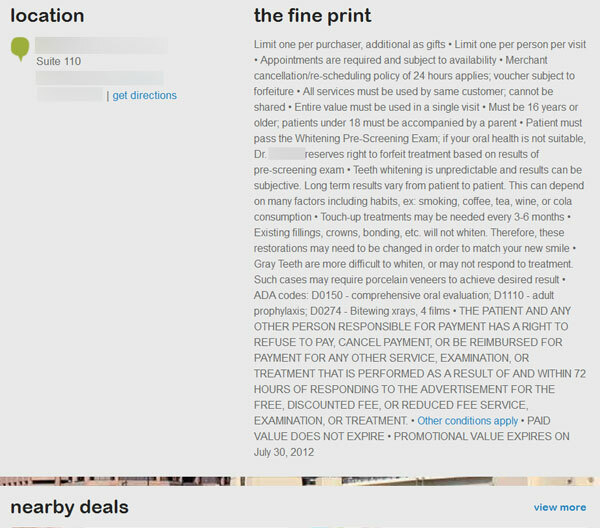 In the case of Groupon, they are getting paid part (usually half) of the fee being collected for each patient. That’s the very essence of fee splitting. (n) Fee splitting: Payment (usually by doctors or lawyers) of part of the fee in return for the referral. Insurance companies don’t get paid part of the fee for services for each patient referred. It’s not even remotely fee splitting. Those are the facts. Whether the state boards will go after dentists for doing it is anyone’s guess. Some states have already started. More will likely follow. Finally, not everybody has teeth. And, with the advent of electricity and blenders, teeth are not necessary for life. Twice as much is spent on hair care and pet food as is on dentistry. Does this definition seem like fee splitting? Groupon, etc, is definitely NOT fee splitting. You do not receive money and then give a portion to Groupon without the patient knowing about it. Quote whomever you like, but the ADA’s position seems to be that fee splitting is when a “secret” relationship is formed between two parties to share revenue without the patient’s knowledge. In this case, Groupon offers a coupon for a discount off the procedure in question and makes it clear that they get something out of it. In turn, they take their portion for advertising (no different than paying a coupon company to produce them for you) and in turn, they pay you the remaining portion. If Groupon were fee splitting, we would need to arrest everyone who ever did a community coupon mailer, internal reward programs, etc. Yes, imagine giving someone a gift card or credit for referring a patient. Isn’t that fee splitting as well? How about paying a marketing consultant or a guy standing in a sandwich board outside your office (not recommended) for every new patient they bring you? Better yet, how about having your staff hand out referral cards with their names on them and giving them a reward for every new patient who comes in with one of their cards? Better yet, I think that we should imprison any dentist who offers to donate all fees to charity from a certain number of patients in a given time period. How dare they consider paying someone else on a per person basis. If, say, a breast cancer charity advertises that all the proceeds from a dentist will be donated to them for a certain time period, is that fee splitting as well? And as far as knowing the cost of an exam, x-ray and cleaning I should say I do. I know, I know. What about all the overhead at the office? This is an equation based on an open schedule. This is based on downtime, open appointments that when not filled with a chance to develop revenue for the office, simply just go by. This is something that unfortunately is a reality in a large majority of dental offices in America today. You already have the office, the equipment and not enough patients to fill your chairs. Obviously, there is no reason to do any deals and this does not hold true if you have a full schedule. But why sit around leaving your chairs empty or closing down and working less hours because you are too proud to open your practice up to promotion. I propose that a dentist, as a business man, get off the high horse unless he can afford to ride on it. If you have a full schedule, with patients paying you top dollar then bully for you. When offices get to that status, I would be the last one to recommend any promotion unless they want to expand and need to fill more chairs. But if you have holes in your schedule, then using a proven business model of direct response or social media promotion makes sense. It was proven a long time ago by the airline and travel industry. Pay your overhead first with discounted services by filling open appointment times. Use aggressive direct response marketing with social media as a good option since there is no cost to run the program. As you fill your schedule and focus on patient retention, your patient base will grow and recall will become stronger allowing you to then cut back on promotion. Over time, you can raise your fees and minimize promotion all together. To sit around with high fees waiting for the next patient to come in is not good business and ego over this very issue has caused more fallen practices in the last few years then ever before. Who says a crown that costs $150 should sell for $1000? Is it better to sell a few crowns at a thousand dollars….or sell 5X as many at 40% less? Does everyone always need the best lab with the highest possible quality? Should you tell a patient or refuse to help them because they can’t pay for the best or nothing? Or is a good dentist someone who also serves people who can’t afford the best by making dentistry affordable for everyone? I suggest a good, better, best approach to my practices. This is what allows the patient to have a choice; to fly first class when they can afford it, while making dentistry more accessible to those who can only afford coach. We always recommend the best of everything to every patient, but we accept and base treatment on their needs rather than ours. I say that these social media companies are giving access to people who might not ever come in. Because it is free to run for the provider, the conversion rate is far lower than that of buying traditional media or toll-free dentist programs. I say use whatever tools you have too to make your practice work today. You’re free to adopt whatever definition of fee splitting suits your needs or agenda. Again, I don’t actually have a dog in the fight. I don’t care what happens with Groupon and dentistry. My purpose here is to simply expose some potential serious liability for those dentists that do engage in social media coupons like Groupon. Before you assume the ADA’s position on fee-splitting (and Groupon), you might want to read my other blog on this topic: Groupon is Fee Splitting – The ADA Chimes in. In fact, the ADA DOES consider Groupon to be fee splitting. But, even THAT doesn’t matter. The ADA has zero legal authority or bearing on the practice of dentistry. What matters is what each state’s dental board thinks. 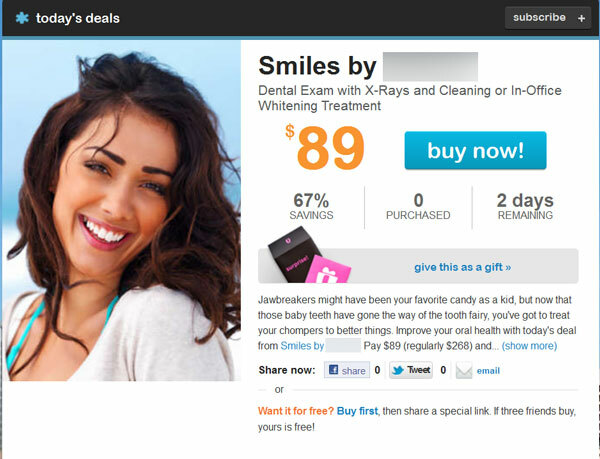 Already some states are pursuing actions against dentists using Groupon. I predict others (and most) will follow. Your assessment of the costs of an exam and hygiene is truly laughable. Maybe you inherited your previous practice (did you ever practice?). And, maybe you had free labor from your wife or mom. But, your assumptions about the costs of scheduling, examination, and x-rays being zero is ludicrous (and I’m being nice). Last I checked, all those things cost me a SIGNIFICANT amount of money and continue to do so. I didn’t get my office for $0. My front desk doesn’t work for $0. X-ray equipment didn’t come for free, either. All said, it cost me about a half million just for the initial build out the facility that allows patients to walk in. I continue to invest as the years go by. None of it for free, mind you. Your derisive tone about high horses and “bully for me” reflect your position of insco executive precisely. I will (not) take such “advice” accordingly. It’s sad, telling, and predictable that your attitude towards dentists is condescending and confrontational. Fortunately, when I started my practice, I realized that I would not be beholden to your industry. My practice is totally fee for service by design, not by happenstance. My position is that every dentist DOES have a choice. So do patients. Third party payers do nothing more than erode the doctor-patient relationship and increase the real costs to patients. Surely as an insco executive, you know that dental “insurance” isn’t insurance at all. Dental care is not indemnifiable via actuarial tables (like can be predicted for a 45 y.o. non-smoker having a heart attack). Dental “insurance” is nothing more than a pre-paid dental benefit. The maximum annual benefit of $1,000 for traditional dental plans from 1965 is STILL $1,000 FIFTY years later. We dentists call your plans “tooth of the year club.” Which tooth do you want to fix this year, Mrs. Smith? All that said, I’m amused and bemused that an insco VP / CFO would come on my little online hamlet to scold us and tell us what’s “wrong with dentistry today.” Look in the mirror. Organizations like yours are what’s “wrong” with dentistry today. But, you guys occupy the tallest buildings in every major city in the United States. So right back at ya… Bully for you. I appreciate your point of view. But, we will forever have to agree to disagree. Dental services are NOT expensive. They are not only for the top 1% earners. That’s hogwash. Those same people who only choose a dentist because they are on their “plan” and those same people that choose a dentist based on the best deal – are the SAME people that leave their McMansion, get into their Beemer, wear designer clothes, and are constantly talking on their IPhone while they wait for their initial visit. The top half and bottom half of the dental market has almost NOTHING to do with economic viability. In this world there are women who will choose a healthcare provider for their family based “primarily” on price. In this world there are women who will NOT choose a healthcare provider for their family based primarily on price. Those are the top and bottom half. Those who will choose based on price are the bottom half. Those that will not choose based on price are the top half. You likely know 30 women in your social circle that would never choose a healthcare provider for their family based on price. If you are married, you are very likely married to one! Dentistry (individual dentists) failed to promote the benefits of what they do. Some were silly enough to believe that the ADA was responsible for doing that. So, individual dentists either did nothing, or, signed on with insurance companies. The insurance companies were smart enough to see the lack of service value in the marketplace, consolidated local markets (employees), and sold them back to the local dentists for 80 cents on the dollar (if that). Let’s call a spade a spade. Dental insurance has NOTHING to do with access to care. Discounting dental services has NOTHING to do with access to care. Both exist (dental insurance and discount dental services) because the majority of consumers do not understand the value they are receiving. This is just plain fun! Not a dentist? Well, that explains a lot. Whew! I feel a bit better for our profession now. Thanks for the clarification, Mike. What a condescending little twit and not even a dentist?! Where the hell does he get off telling us . . . Wait, I remember, he’s with the so-called dental insurance industry who see dentists as greedy and dishonest and rich. WHATEVER! He has zero credibility. Intersting. $0 cost for a recall, exam. No wonder my gross las month was $0 🙂 Way back in the 70’s dental insurance came to Canada. There was a major political push by dental associations to not accept assignment as full coverage. In Ontario we use the ODA fee guide. It is a guide but a dentist by law, cannot send a bill for let say $100 to an insco and accept the coverage as his/her total payment. If I charge $100 ( That’s $100 not 0 🙂 ) and I accept the inso coverage, which let us say ius $80 then in fact I am billing $80, and should submit it as $80. Licences have been suspended for 3 months as this is considered frayd. As good fortune would have it PPO’s etc went over like American beer at a Candian Hockey game ( Hey had to get a dig in 🙂 ) . But, seriously the efforts of organized dentistry in the 70’s saved us from having some suits in a building tell us how to practice and more inportantly how to bill or accept what they deem we are worth..
Just a quick comment. Noticed John labeled dentistry in the category of “disposable income”. I think the term disposable income is false term. To categorize some expenses as “necessary” and others as “discretionary” doesn’t serve any productive purpose, in my view. People pay for what they want, plain and simple. Sure, most of us have food and shelter as our highest “wants” but all spending is based on values/wants. Hi Ryan! Thanks for dropping in. I also noticed that, but I could only address so many of the erroneous notions in his post. Really? My time is worth nothing? Digital x-rays are free? All my supplies are free? Well DAMN – I gotta get you in touch with my Schein rep to tell them that they’re all overcharging me by 100%! And my IT company, too! And my employees are going to LOVE learning that they’re all working for free! And I can’t WAIT to tell my landlord that the VP of AETNA tells me that I don’t have to pay rent! WOO-HOO! Um………………..WTF are you smoking? And would you care to tell us just how much YOU are making? If it’s anything like that loser CEO of the Washington Delta Dental “non-profit” who got paid $1.2 million last year, you’ve got no frigging leg to stand on. I wouldn’t be surprised if you got paid more than almost any dentist in the country. Dental insurance is a rip-off. Same supposed “benefits” today as about 40 years ago….what a JOKE. His silence is golden right now. This has potential to be a national news story. Great comments so far. Keep them coming and send the link to your friends! I think Mr. Bermel (Aetna) and Mr. Dwyer (Delta Dental) are birds of a feather… no surprise. When they show their true colors, their contempt for the dental profession is patently obvious. Yet, they publicly claim to be “advocates” for dental health. They are the poster-children of hubris. $0 for exam, cleaning, x-rays, Mr. Bremel??? Really? That’s just disgusting. Are you volunteering to pay off my student loans then? Unbelievable. Sorry Mike for being so late to the party. I learned the lesson back in the mid-80’s when Aetna introduced a program called “Prevent” and “selected” me as one of the “Select” providers in South Jersey. After 12 months, Aetna was about $200K behind in their payments, and attributed it to “adverse selection”of the group of employees who came in for treatment (with no limits). Seriously, dental insurance that WAS ACTUALLY INSURANCE and not a reimbursement program that pitted practitioners vs patients at the behest of these “Ins. Co’s”. So, imagine my chagrin, when they choppered down from Hartford, and then limo’d to my office with a 20% offer! Having dropped all but Delta from my practice, because I couldn’t allow insurance companies to dictate how I provided my services, I can tell you that most patients who appreciate quality care are willing to pay for a high level of service. It’s scary what dental schools are turning out today, and these drones will go to work for the ins. co’s. My biggest fear is who will take care of my teeth, my grandchildren’s teeth once I retire. Our profession’s largest problem is not being met head-on by the ADA. I can’t understand how recent graduates can survive. I used to say, I would never let my kids go to med school because the MD’s made the mistake of getting into bed with the ins. co’s. Any practitioner that comprimises his/her care because they can’t break even on what ins. co’s pay needs to undermine the entitlement mentality that pervades the public. 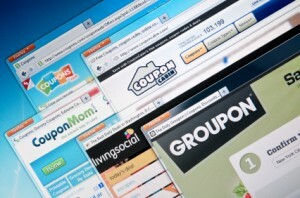 ADA advises that social couponing is fee splitting. The ADA advisory opinion approved by the council is as follows: “4.#.1. “Split Fees in Advertising or Marketing Services. The prohibition against a dentist’s accepting or tendering rebates or split fees applies to business dealings between dentists and any third party, not just other dentists. Thus, a dentist who pays for advertising or marketing services by sharing a specified portion of the professional fees collected from prospective or actual patients with the vendor providing the advertising or marketing services is engaged in fee splitting. 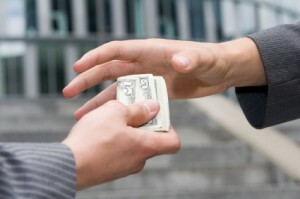 The prohibition against fee splitting is also applicable to the marketing of dental treatments or procedures via “social coupons” if the business arrangement between the dentist and the concern providing the marketing services for that treatment or those procedures allows the issuing company to collect the fee from the prospective patient, retain a defined percentage or portion of the revenue collected as payment for the coupon marketing service provided to the dentist and remit to the dentist the remainder of the amount collected”. Anyone who thinks Groupon isn’t fee-splitting is putting his head in the sand. Again… I personally don’t care if anyone fee-splits. But, the state board sure does. And, Groupon IS fee-splitting in the simplest of terms. So, it becomes a matter of whether a dentist is willing to gamble on how long it takes before the board starts enforcing the rule. Funny that once John Bermel was outed he ceased commenting. Funny… but sad and pathetic. Mike you rock and your blogs are the best! Sell treatment??? LOL, are dentists used car sales-mans? There is elective dentistry (veneers, teeth whitening) and then there is the meat and potatoes of dentistry. The bulk of dentistry is not “selling” anything. Cavities, missing teeth, gum disease are huge oral health problems that dentists can help with. Thanks for chiming in. I see your point, and I agree that “selling” in the traditional sense is not our goal. Our primary directive isn’t just to get warm bodies in so we can “sell” them something. That said, I do believe that we ARE in sales. We are selling health, beauty, and comfort (or lack of pain). Most people don’t know they have a cavity. So, we’re “selling” them on the notion that they DO have a cavity, that they can trust us, and that we are the right dentists to treat them. We sell them on the benefits of a better quality of life through high quality dental care. In the end, I believe our type of “selling” is quite different than the type implied by Mr. Bermel. Hi Mike, just came across this post, not sure how i missed it. You know how I feel about Groupon as we have had numerous conversation in the past years about how it has done for my office. As you also know not everyone is like me so if the state board allows it my suggestion is to try it out and see what it can do for your practice. My last Groupon deal has not been as successful in terms of large treatment plans but I have had a large % of them purchase my Oral Health Savings Plan to stay in the office. I’m always interested in your perspective! Chime in any time! John Bermel, MBA. The MBA explains a lot! MBA programs spend a good amount of time reviewing excess capacity, how this affects the bottom line and how to manage this. The problem is Bermel does not fully comprehend how insurance contracts do not allow for this type of management. I took a mini-MBA course geared towards dentists at Pitt. Similar to what the ADA offers with Kellogg in Chicago. This exposed me to these theories. The focus in excess capacity management is how much does it cost to produce that additional widget. It considers that fixed overhead has already been met with what has been produced previously in a given time period. It assumes that labor is zero since they would have been dawdling around the plant anyways. That would let the widget plant set the price of additional widgets at the cost of materials plus profit. (sounds like Bermel’s argument). 1. Find a new customer and offer them a limited time offer on a limited amount of widgets with the hope that the new customer will like the job performance so much they will stay on after the initial term as a regular customer. This technique allows companies to only make the offer when there is truly excess capacity and only offer an amount that does not put them beyond capacity. Going beyond capacity will necessitate investment in more in capital expenditures thus negating any gains made. 2. Widget companies will offer to a few companies a deal on widgets but seek modification of contract terms. Example: Acme Widget normally will sell 10K widgets for $10K to be delivered in 2 weeks. The offer would be changed to 10K widgets for $8K deliverable in 4-8 weeks. In this example Acme only works on the order when it has no other work. This allows them to more fully maximize their facilities and fixed overhead. 3.There are a couple of other methods that are really beyond the scope of this discussion. The fallacy of these management techniques is the amount of free enterprise allowed by insurance contracts. As seen in the above examples, Acme Widget is free to set their terms and change them as they see fit. They can easily increase and decrease the amount of work or price based upon the amount of excess capacity. With insurance contracts there is very little negotiation of fees, delivery of services can not be adjusted (there is normally a clause requiring that plan patients be treated the same as non-plan patients aka scheduling), it can take up to 90 days to terminate a contract etc. With non-descrimination clauses it may even be a breach of contract to stop taking plan new-patients while you accept non-plan new-patients. Patient abandonment and malpractice also become issues if you try to delay treatment to maximize profits. Insurance contracts effectively negate the benefits of the management techniques they try to use as arguments for signing up. The discounted fees become a problem when they become the norm in the practice instead of the exception. In this case the excess capacity management theories get thrown out the window and you find practices jettisoning discount plans. As an aside, another lesson we learned (in another lecture) is that a business should only strive to schedule itself at 80% capacity not 100%. When you run at 100%, you will be losing potential future customers and may upset some current customers. There is no room for error, delays, rush orders, etc. This has a negative impact on customer satisfaction. Just my 2 cents on why John Bermel and the other insurance execs are wrong in their academic explanations as to how their product should work in our practices. They quote a reasonable management theory but fail to factor in contract limitations that destroy their argument. Thanks for your comment, which was very interesting and enlightening! Anyway, the benefit of paying Groupon or really any company that can generate a visit to your practice of someone who is new to you and you can execute the skills you have honed over the years to wow them with your new patient experience, is that, simply, empty chair time is filled with an individual that just might like what you have going on in your practice and now you have a chance to convert them to a long term member of your patient family. Any advertising has costs. Most advertising has risk. You pay a bunch of money up front and hope for the best. Of course you can minimize the risk by working with folks like Mark who have researched every way to attract new patients to your practice, but in the end it is somewhat of a crap shoot. Now with Groupon and other more suitable lead generation methods, you do not have this risk. Instead you accept the risk that SOME of the individuals that come in will be bottom feeder bargain shoppers and will never convert to long term patients. And the way Groupon has evolved, this very well may be true of most of these individuals. However, in the Interent marketing world that I live in, one model is to work with a company that can generate new patient phone appointment requests. The company invests in their own advertising. then an arrangement to pay per call or pay per appointment or pay per initial sale or some other kind of mutually agreed upon compensation arrangement is worked out. The benefit to the dentist, is no advertising risk. In the end no matter how you figure it, if have available chair time and choose to promote your practice to fill that “inventory” you will incur some cost to do so. You can learn how to do internet marketing yourself and incur the cost of your time. You can learn to design postcard mailers or design billboards and incur the cost yourself. Or you can pay someone for services to promote your practice hoping that the results give you an ROI that makes sense. In full disclosure we are working on building out a system that will deliver phone calls to practices from patients who are interested in improving their smile and want to work with a dentist in their area and currently do not have a “dental home”. To market this service to dentists, our intention is to offer it without any risk to the practice. Meaning you pay when results are achieved. Meaning an individual calls your practice to book a new patient appointment. It can be a beautiful thing if it works to everyone’s benefit. It would be a shame for the dental boards to outlaw a service that we may be offer to dentists that eliminates the risk they face with other advertising campaigns, simply because such a practice of paying for results would thus would be considered some kind of fee-splitting arrangement. Fee splitting should remain in the realm of what happens when one professional is compensated by another professional to deliver referrals, not because a dentist decided to use a way to pay for a promotion that eliminated the risk of advertising with poor or worse no results. Thanks for joining the discussion. Maybe we are picking on the “wrong” guy. But, maybe not. I found another dental plan site (in addition to the one you found) registered to a person by the same name. The Mr. Bermel that chimed in here claimed to have received MILLIONS of calls from patients looking for dentists. I don’t know, but if that’s true, it’s likely an insurance company, not some small dental referral company nobody’s heard of (like 1-800-Dentist, for example). Or, it could be that he has multiple business interests. I don’t want to reveal anyone’s personal information any more than necessary or prudent… but, I’ll just say that some people have multiple addresses… and those same people have registered different websites / businesses in those different cities. If I have committed any sort of mistaken identity, I apologize to all parties. I’m not so sure that’s the case… But, it’s possible. He hasn’t returned to reply to any of the comments. So, we may never know. As for fee-splitting, Groupon’s arrangement with dentists is the very definition of fee-splitting. That is a FACT. It’s not advertising by any stretch. It’s splitting fees collected by Groupon. It’s perfectly legal in other businesses. But, it’s not in health care. I know in Florida, you can’t split fees with ANYONE, not even another patient. I can’t even reward patients for referrals with any sort of compensation. This is an interesting topic and I thought that I’d chime in from a patients perspective. First, I don’t have insurance and recently needed a cleaning. I missed my scheduled cleaning with my normal dentist a few weeks back, and I also knew that it was time for some xrays. Along comes a Groupon offer, $50, cleaning, xrays and whitening. I felt bad sneaking in a cleaning like this, but heck, it’s just a cleaning and some xrays and the dentist is right down the street, a new practice looking for new patients. Well, xrays came back with a couple of cavities, and a potential problem with a prior root canal. $1200 in recommended services. I felt terrible as I know how the Groupon thing works, offer low cost exam and if there are some problem areas, you make your money back on future treatment and hopefully retain the customer. The problem is that I want MY dentist performing these tasks, I don’t know this new dentist and trust my original dentist who has always provided a first class experience. I called my dentist with my tail between my legs, and he laughed, has obviously seen this before and I will be going down to see him later this week. I found this board because I am interested in how the dentistry (and other professions) are going to deal with this Groupon mentality. It’s interesting for me to see how these company’s (Groupon and others) are potentially turning parts of your practices into a “comodity” (no offense intended). I own a company and am also in the service industry. Thanks for any thoughts that you have. They say a majority of patients coming in with the Groupon already have “regular” dentists. They’re just there for the “deal.” Or they are patients who don’t have a “regular” dentist, and they float from Groupon deal to Groupon deal. They often do not stay on as a regular patient. And, just like so-called “dental insurance,” Groupon precipitates a “race to the bottom,” commoditizing dentistry by making the lowest fee the driving force behind decision-making. Thanks for chiming in, James! Getting back to Groupon, I find any kind of discount is a slippery slope for professional services. Once people believe your price is flexible and negotiable, they’ll push hard for a deal and never want to pay ‘full retail’ again. Woke up this morning thinking about Groupon and remembered this column. Actually skimming through all the comments the last one by Joe seems to me to sum up the actual psychology. Once you take a low fee patients will never want to pay you the going fee. They’ll pay someone else, but not you. In 2000 I realized 80% of the office income was from 20% of the patients and started to drop the low ball participation plans one by one. At times there was a mass exodus of patients from my practice and the income actually went up. I have run into patients over the years who would tell me how happy they were with the crowns I did on their front teeth – then add huffily they had to leave “because you stopped taking my insurance!” And I know they went to a practice where they have to pay full fare out of pocket. I agree and suspect that many Groupon patients will move on to the next deal after redeeming yours. That said, some do report keeping those patients at regular fees after the deal. They “wow” them with the service, and the Groupon patients stay. So, they say. I always smile when someone laments that they “had to leave because I don’t take their new PPO / HMO plan.” I say, “It’s a free country. There’s nothing or nobody FORCING you to go anywhere. It’s your choice, and you have your own reasons. But, you don’t HAVE to do anything.” I’ve actually said it… to no avail, mind you. But, it makes me feel good, realizing there’s not much chance I’m going to change their minds anyway. Isn’t it illegal to split fees with a 3rd party because it may effect the quality of treatment preformed ex cutting corners?